Alan and I are confused by this tattoo. We are not sure if it is correct or not, simply because we have never seen this idiom. 凌辱 is used in both Chinese & Japanese to mean an insult, indignity, disgrace or violation, even to assault a woman. 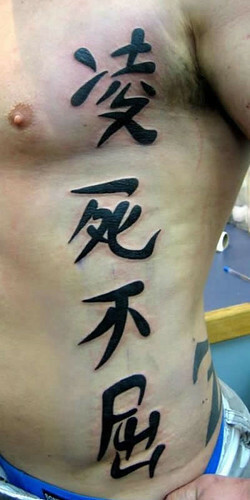 So we can sort of see how 凌 might imply "dishonor" and 不屈 does mean "fortitude" or "indomitable". But we simply do not understand the grammar or syntax of 凌死不屈, since 凌 could also mean "pure; virtuous; insult; maltreat, encroach; soar; thick ice". It simply sounds like the words "dishonor" "death" and "indomitable" run together.